ALL FOUR SESSIONS OPEN TO 7U through 14-U & Session IV open additionally to 15U, 16U & 18U! WS I, II & III are separated by class if at all possible while WS IV is an open event. HUGE Opening Ceremonies Parades, Exclusive Pin Trading & Sports Trading Card Events, One of Kind Award Packages with the now famous 7-foot tall, 30-pound, 4-real wood bats championship trophy, championship banners, the biggest bling rings you will find anywhere and so much more! 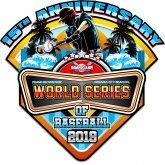 The 2019 Grand Slam World Series of Baseball is unlike ANY other World Series tourney in the Country. Our World Series is not just a tournament, it is an EVENT! $750 Entry Fee plus your $60 2019 Grand Slam Sanction Fee! $650 TEAM GATE FEE. NO admission at the gate, EVERYONE gets to come and go as they please! This equates to $54.16 per player based on 12-players per team. This is to HELP SAVE PARENTS a TON of Money by attending our event. Do the Math: $10 per day for adults x 2-parents = $20 per day x MINIMUM 4-days of admission cost = $80. 5-days = $100 and 6-days = $120. This doesn't even include kids over 12, grandparents, other relatives, friends, etc.... Just ANOTHER way for us to show our appreciation to the teams for supporting GRAND SLAM SPORTS TOURNAMENTS and our 2019 GRAND SLAM WORLD SERIES OF BASEBALL! AGAIN, your team gate fee covers EVERYONE! There is NO charge to get into the park! Huge Opening Ceremonies on the Sunday prior to each WS at beautiful PIER PARK with pool play games starting on Monday. Championship Bracket play starts on Wednesday or Thursday each week and concludes on Saturday! SUNDAY IS THE RAIN DATE! ** In WS III, Thursday, July 4th will be our rain date so if it doesn't rain earlier in the week, EVERY TEAM WILL HAVE JULY 4th off! PLEASE prepare as though you will play on Sunday. Our opening ceremonies parades are second to none in the entire Country! Viewed by THOUSANDS of people at beautiful Pier Park who are not even involved in our baseball event! It is truly a one of a kind experience for the players! Pin Trading Headquarters & Sports Card Trading Headquarters along with Vendors Galore plus HUGE Pin Trading & Sports Card Trading Event at Rock-It Lanes right after the Opening Ceremonies Parade. We also feed all the COACHES FREE at the Pin Trading & Sports Card Trading Event! This event takes place the day before games begin at Rock-It Lanes in PCB! Grand Slam Supplies Two New Wilson A1010 Baseballs per game! Team & Individual Awards including the now famous 7-foot tall 4-real wood bat 30-pound Championship trophy to the top-3 or top-4 teams in each age division and class (depending on # of teams) PLUS in 2019 we will unveil our Biggest and Best WORLD SERIES CHAMPIONSHIP RINGS yet for all champions!! Host Properties: We strive to give you the best options on housing at the Beach. Visit our Web Site at http://www.grandslamtournaments.com to see our 2019 Housing partners as we are posting them daily! Our World Series are not just a Tournament, they are an EVENT! We BELIEVE very strongly in making this an unforgettable experience for every participant! We give EVERY team a DAY OFF to enjoy the beach and the area attractions! We have an official sports photography company, ROMO PHOTO, that captures all the great moments and experiences of your World Series event! FOUR game guarantee, 2-pool play and DOUBLE Elimination Championship bracket play! Create your team account, pay your once annual sanction fee, register for the World Series you want to attend and you are on your way! Keep in mind that classifying teams is VERY SUBJECTIVE and a very inexact science. Unfortunately there will always be "sand baggers" & "trophy hunters" in our world but we do the best we possibly can to make sure all teams are classed appropriately within the Grand Slam organization. Will we always get it right? Absolutely not! Again, it is very subjective and a lot of teams are what we call "tweener" teams; teams that can potentially dominate the American class one weekend and not even complete in the National class the next weekend. This is the gray area when it comes to classifying teams. We leave it up to our respective State Directors to place teams in the class they feel is best suited for that particular team. We reserve the right to move a team up or down prior to our World Series event or during the regular season based on their play in the Grand Slam sanctioned events. For teams who do not have the opportunity to play in our qualifying events, we place them in the class that is on an equal basis with other travel baseball organizations. The “ROOKIE” class teams are start-up and rec ball type teams. The "AMERICAN" class teams are teams that are average travel ball teams and not quite at the elite level of their age division. The "NATIONAL" class teams are teams that are above average travel ball teams and compete on a higher level than the American class teams. The “ELITE” class are teams that are the cream of the crop in their respective age division. In our World Series events, we do our best to separate into TWO separate classes, Rookie & American and National & Elite. There are occasions where we have to combine all teams and when that is the case, we still award the highest finishing 3 Rookie/American teams and the highest finishing National/Elite teams. In other words, SIX teams in a combined bracket receive awards, 1st, 2nd & 3rd in both classes. World Series Session IV is an OPEN event! All 8-U CP through 14-U teams that are based in GEORGIA, ALABAMA, NW FLORIDA PANHANDLE & MISSISSIPPI are required to play in FOUR total qualifying events which includes the 2018 Southeastern Championships or your particular State's "State Championship" event in order to participate in a Grand Slam World Series event. 15-U and up teams do not have to play in any qualifying events. Teams from ALL other states can register on a FIRST COME BASIS as there are NO qualification procedures. We urge you to sign up for your World Series event NOW as they sell out well in advance. World Series Session I and Session II were sold out by late February, early March in 2018. Session III Sold out shortly thereafter. If you are required to play in qualifying events, you can sign up for these later.....DO NOT WAIT as you could get shut out of the week you want to play! The 2019 Grand Slam World Series of Baseball Sessions I, II, III & IV will be held for the 15th STRAIGHT YEAR at beautiful Frank Brown Park in Panama City Beach, Florida, home of the World's Most Beautiful Beaches! © 2019 Grand Slam Tournaments. All Rights Reserved.